This elegant take on venison meat is an unexpected blend of nutty, rich, sweet, pungent and bitter flavours. Seasoned venison is seared and fileted to top a heavenly kale salad in a blue cheese cream sauce. Dan recommends taking it easy on your venison and getting rough with your kale to bring out the best both have to offer. • Take your piece of venison and season with salt and pepper on both sides. • Pour Canola oil into a hot pan and add in your venison. While preparing your salad, occasionally check on the venison. You want to have a brown and almost caramelised effect on each side of the venison. Check occasionally to see that the venison is looking browned and somewhat caramelised. When this is achieved, flip and do the same to the other side. When the venison is ready to be removed, place it on some paper towels to rest. • In a large bowl pour in your heavy cream and crumble up your blue cheese and mix the two together. Your fingers work best for this task. • Pull the kale off of the stalks. Next tear the kale into smaller pieces and add to your cream and cheese mixture. • Now take your celeriac and peel off the skin. When that is done, take a grater and grate the desired amount of the peeled celeriac over the kale. • Pour about ½ of your almond oil over the salad. • Take your shallot and slice it into fine pieces. Mix everything together. • Take the venison and slice off pieces against the grain of the meat. 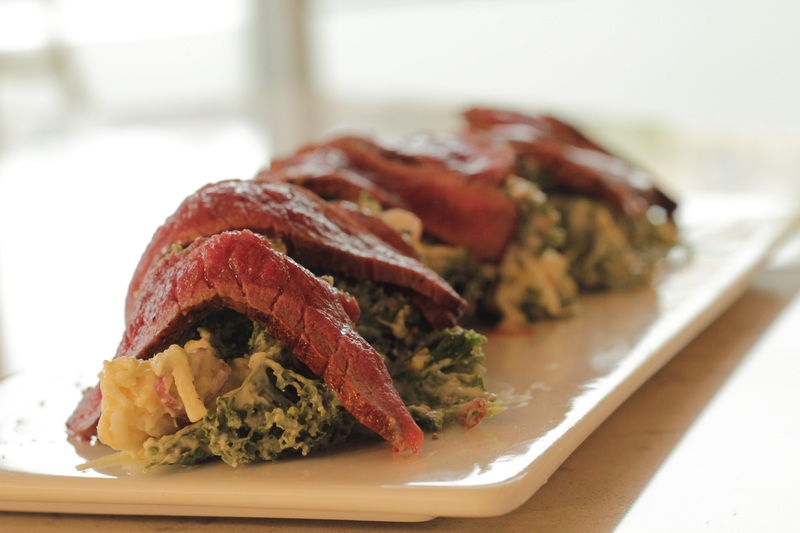 Arrange your salad on a plate and place the venison slices over your salad. Pour the rest of the almond oil on top and end with some freshly ground pepper.